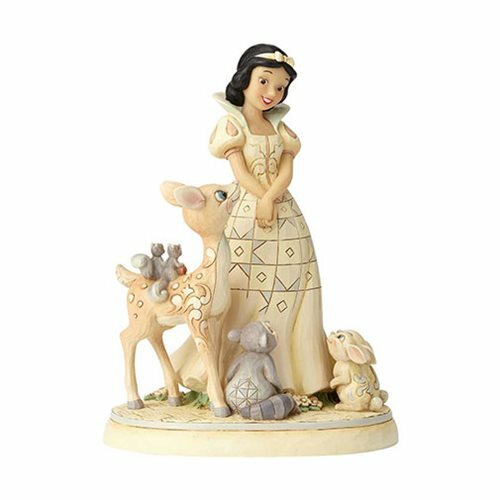 Snow White's woodland friends gather eagerly around their beloved princess in this handcrafted Disney Traditions Snow White White Wonderland Forest Friends Statue by Jim Shore. Beautifully sculpted from stone resin and hand-painted in a creamy palette of soft neutrals, the sweet scene captures the enduring appeal of Walt Disney's first animated feature film. Traditional quilt patterns and rosemaling swirls lend a whimsical folk art finish, and the timeless design makes a beautiful gift for Snow White's most devoted fans, young and old. Made of polyresin and calcium carbonate, the statue measures about 7 4/5-inches tall x 6-inches wide x 4 3/5-inches long.